Every two weeks, Big Issues focuses on a newly released comic book of significance. This week, it is Green Lantern: Earth One. Written by Gabriel Hardman (Kinski, Invisible Republic) and Corinna Bechko (Invisible Republic, Star Wars: Legacy) with art by Hardman and colorist Jordan Boyd (Invisible Republic, Deadly Class), this original graphic novel shows how DC is using imprints to reinvigorate its major characters and expand its readership. This review reveals major plot points. DC Comics has undergone an astounding transformation over the past two years. After stumbling with the line-wide relaunch of The New 52, DC repaired connections with readers and retailers with DC Rebirth, an event that signaled a greater change across the entire publisher. Two months after Rebirth began, DC released the first volume of the DC Superhero Girls, a franchise that has given the publisher a strong foothold in the middle grade graphic novel market, and two months after that, the Young Animal imprint debuted and became the new place for ambitious, mature reimaginings of DC IP. The Rebirth titles were given considerable time to build their audiences before facing the threat of cancellation, and with Young Animal, the books ended after 12 issues, took a break, and then came back with new directions that keep the line feeling fresh. Just this year, DC has already made some very significant gains by announcing multiple new imprints geared to different markets. Building on the huge success of DC Superhero Girls, DC Zoom and DC Ink feature original graphic novels for middle grade and young adult readers. DC Black Label puts all-star talent on the company’s biggest characters, with each series having a format and release schedule tailored to the needs of the creative team and their story. Brian Michael Bendis is taking his Jinxworld imprint from Marvel to DC, launching new books that reinforce his commitment to his new home. And Vertigo is getting a major bump for its 25th Anniversary with the launch of Sandman Universe, expanding on the classic title with Neil Gaiman in a leadership role. DC has figured out how to cater to comic shops while also taking advantage of the steadily growing bookstore market, and it’s thinking beyond its core superhero line to bring in new readers and improve the diversity of its output. This isn’t necessarily a new thing, but there’s a much more aggressive push right now than there was in 2010, when DC debuted its Earth One line of original graphic novels. These books feature big-name creators reinterpreting characters like Superman, Batman, Wonder Woman, and the Teen Titans with a fresh point of view, serving as easy entry points to key DC concepts. While the quality varies, these books show the value of starting from scratch and letting creators shape these stories in more specific ways. The New 52 tried to build a new DC Universe, but there were editorial constraints that diminished creativity. Earth One provides much more freedom, and this month’s Green Lantern: Earth One represents a new high point for the imprint as Gabriel Hardman, Corinna Bechko, and Jordan Boyd give Hal Jordan and the Green Lantern Corps a makeover that prioritizes science fiction over superhero elements. The cover evokes the iconic poster for Ridley Scott’s Alien, with the ring’s green light cutting through the darkness of space to illuminate Hal Jordan in his spacesuit. That connection adds a sinister quality to the ring’s energy, and sets an ominous tone for the story to come. There’s a lot of Alien in this book, and like the crew of Nostromo, Jordan and his colleagues on the Ferris 6 are contractors working for an Earth corporation, Ferris Galactic. They’re on a mining expedition in the asteroid belt between Mars and Jupiter when Jordan finds a spacecraft that crash-landed 100 years ago, and he discovers a decaying purple alien corpse, a powered-down robot, and a glowing green lantern with an accompanying green ring inside. The discovery of the lantern takes the story in a new direction, and the action begins with the alien ship falling off a cliff, forcing Hal and his companion, Volkov, to make a daring escape. The lantern sets off an explosion that destroys their shuttle and kills Volkov by shooting him into the vacuum of space, but Hal is able to survive by holding onto the ring. There’s a rush of superhero spectacle, which only intensifies once the robotic Manhunter activates and attacks Hal. 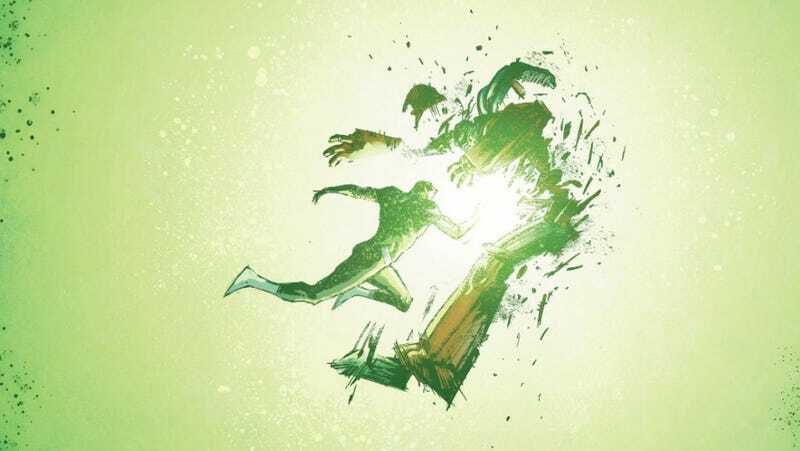 The layouts become more dynamic as Hal engages in his first space battle, with diagonal panel placement and extreme angles that amplify the motion and the force of this fight. Hardman adjusts his layouts and compositions as the story shifts from Alien-inspired sci-fi horror to epic sci-fi fantasy, but he maintains a sense of balance to keep readers firmly planted as the plot becomes more extraordinary. The colors by Jordan Boyd are very subdued at the start of the story, emphasizing the monotony of the mining operation. There’s nothing thrilling going on here, and when Hal Jordan tells his crew that he’s “done with Earth,” it gives the impression that this work is some sort of bleak penance for sins of his past. The lantern offers a different option, and its green light illuminates a new path for the character. Green can be an abrasive color, but Boyd veers toward a creamier mint green that makes it softer on the eye and less toxic. Hardman adds texture to the energy by using different brushes and ink splatters, and Boyd uses multiple shades of green to make this visual element even richer on the page. There are sequences when everything gets very bombastic, but the creative team include moments where they can situate readers in a new environment and get a feel for how Hal interacts with his surroundings. This Hal Jordan isn’t a gung-ho adventurer who charges into the unknown with his magical space ring. He’s an intelligent, pragmatic pilot who thinks before he acts and puts the safety of his crew before his own. When he’s denied re-entry on the Ferris 6 because of potential radiation contamination from the strange green energy, he understands the protocol and doesn’t argue with it. And when he ends up on an alien planet with a fellow Green Lantern, Kilowog, Hal makes it clear that he wants to figure out how to use this piece of machinery before he does anything rash with it. There’s plenty of room for the writers to delve deeper into Hal’s character, but they intentionally keep his background a mystery for much of the story. It puts readers in the same position as the people surrounding Hal, asking why he’s exiled himself from his home planet. This information is eventually revealed, and the writers thematically tie Hal’s personal story to the cosmic narrative. They both revolve around authoritarian entities who use their power to assert dominance over groups of people who are growing too diverse and unwieldy to control, and Hardman and Bechko’s concept situates the Green Lanterns as enemies of authoritarianism. The writers cut some major aspects of Green Lantern mythology, all in service of grounding the story. Ring-bearers no longer need to recite an oath about vanquishing darkness to charge their rings, and they aren’t chosen by the rings because they have extraordinary willpower. The ring is like any other weapon or tool; anyone can pick it up and use it, but without proper training, it can pose a great risk to wielders and the world around them. That distinction between a weapon and a tool is important to this story. A weapon is used to fight and defeat, an instrument of destruction that asserts power. Tools can be used as weapons, but they have a much more positive connotation as objects that help people build rather than tear down. The Green Lantern rings exists somewhere in the middle, but Hal views it as a tool to help others. The final moments of the story reveal just how profound an impact this ring has on Hal’s worldview, and after teaming up with others to stop an intergalactic threat, Jordan realizes just how much his homeworld needs him. Hardman and Bechko’s work on their creator-owned Image series, Invisible Republic, shows how much thought goes into the world-building of their stories, and each issue’s backmatter breaks down Bechko’s research surrounding biology, technology, and politics. The actual scripts aren’t overloaded with this information, but the time spent fleshing out these specific elements makes for a more fully realized vision and gives Hardman more to work with when he starts designing and putting these ideas on the page. The backmatter of Green Lantern: Earth One doesn’t include these types of pieces—it’s mostly sketches with the original written pitch—but the confidence and complexity of this book suggest a similar attention to detail in the planning process. There’s a very strong foundation laid here for future stories, and hopefully it won’t be too long a wait for the second volume because this creative team sets up a sequel that promises to go even further with this compelling sci-fi superhero concept.